When someone gets a new rooftop solar installation, the second question they always ask is "how often do I need to clean my solar panels." Rooftop solar panels get dirty primarily from wind-blown dust and pollen. Birds are usually not a problem unless your last name is Hitchcock and you live in Bodega Bay. As panels get dirtier, their output declines. A small amount of soiling — say a light dusty film — may only cause a 5 percent output decline. However, when panels get very dirty — perhaps in an agricultural area or location that does not get regular rainfall — the output decline can be greater than 20 percent. A good heavy rainstorm will usually wash away most of the accumulated soiling. I use the term "usually" because on panels that are tilted at about 5 degrees or less, the rain may leave a puddle of muddy debris along the lower edge of the panel. When this puddle dries, sometimes a thick layer of dirt accumulates along the lower row of cells (sometimes moss and weeds may even grow in these areas). Depending on the design of the system, this small accumulation of dirt can cause a very significant decrease in output. 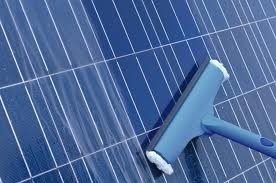 So the answer to the question: "how often should I clean my solar panels" really depends on five factors: your location (does it rain regularly or only during certain months), the tilt angle of your panels (steeply tilted panels tend to stay much cleaner than panels that are close to horizontal), the amount of wind blown dust, your electric rate (if your electric rate is high then it is more worthwhile to clean your panels), and the cost to clean your panels.